Wow! Lots of great happenings have occurred over the last few months. Let’s go through and summarize our race season, and then look to the fall season where we turn our focus to running, fall rides and ahem, moving indoors. 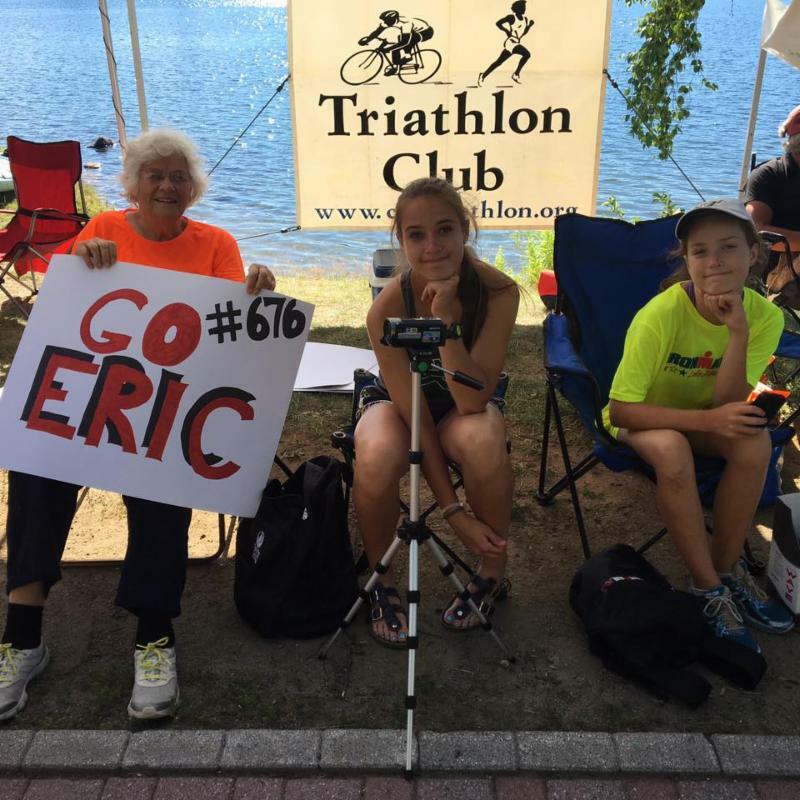 First of all, a big thanks to our newsletter editor Molly English-Bowers for generating and maintaining what has to be the best Triathlon Race Calendar out there. Located on our website (cnytriathlon.org), this site contains every known race in the area, and is updated on a regular basis. We again enjoyed successful site training on Tuesday and Wednesday nights. The club will continue to evolve the site training next year. In addition to Gillie, Oneida Shores and Jamesville Beach, Saturday morning Green Lakes training events turned out to be a successful trial program and we are looking to repeat and possibly expand this next year. Incidentally, the final Green Lake training day became a fun, unofficial race. With transition racks set up, almost 40 folks took on the challenge, and coming in first was Heather Nelson, who totally destroyed the rest of the field (read her Athlete Profile later in this newsletter)! The YMCA Triathlon program (director Jennifer Hughes, with many coaches) seemed to really burst on the scene this year. Many club members are YMCA members and enjoy the unique offerings from both of our organizations. 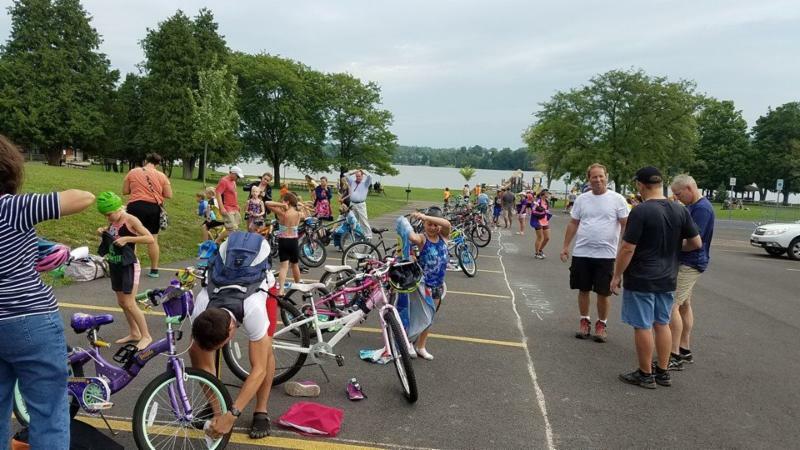 This includes OWS and rides from Green Lakes, and we hope to continue to work with the Y program to find opp ortunities to help the local triathlon community. The summer was full of fun races. 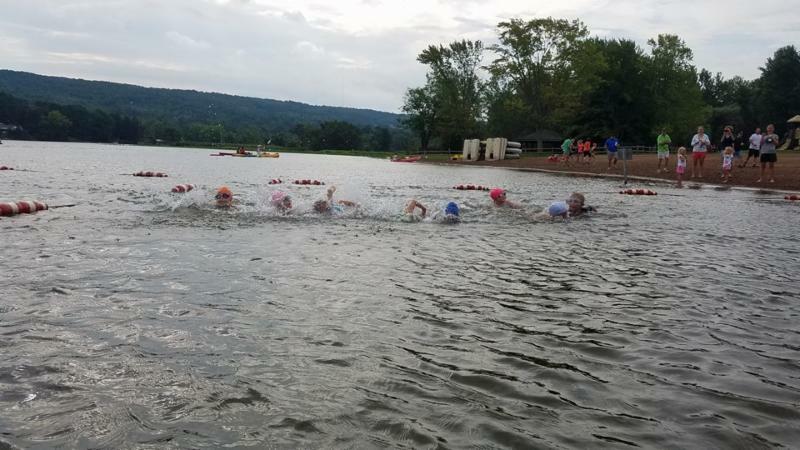 The Tri Club recently concluded its annual Cazenovia Triathlon with the help of local race director Kenny Hammond. 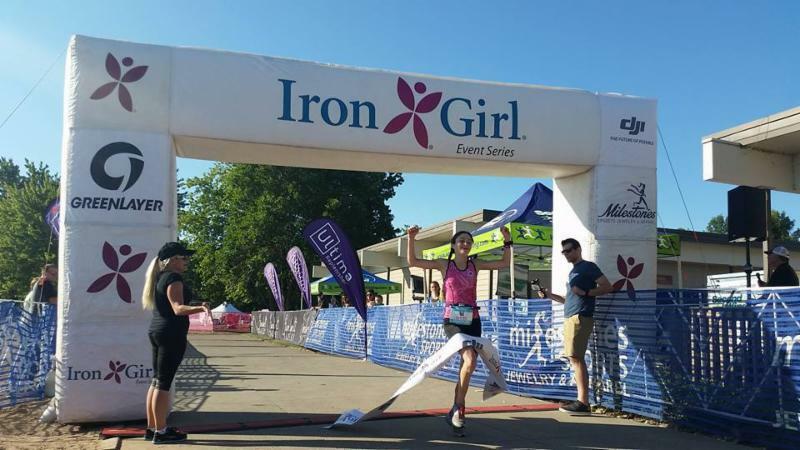 In addition to the numerous short distance triathlons, manyclub members raced at the big venues, including Ironman Syracuse 70.3, Timberman 70.3, Ironman Mt. Tremblant, Ironman Lake Placid (photos from my IMLP experience at top and left), and also at Toughman races (including Tinman in Tupper Lake) and local favorite, Musselman.The Tri Club had a tent along “tent row” at IMLP and provided a base for both racers and spectators with complimentary snacks and drinks for everyone who stopped by. Many thanks to club members Karyn and Steve Plante for organizing and setting up the tent. In closing, I want to say that, as always, our club is just that…….ours! We are always looking for ways to grow and improve. This past year, we had many folks step up to lead classes at the WTF (biking, yoga, strength, parties), the Kids’ Tri program, and community clean-up events. If you have something you would like to do with or for the club, please share your ideas. Next Board Meeting: Sunday, September 11, 6 p.m. The results of the recent club elections will be announced shortly. That being said, the club always welcomes members to join the leadership team and take an open non-board position, or even create a role for which you want to contribute to our club.Board meetings are held at 6 p.m. on the second Sunday of each month at the WTF. This is typically the most convenient day given the board members’ personal, family and race time commitments. The next meeting is Sept. 11. Mark your calendar: Tuesday, December 6. This annual events brings together members and prospective members for a gathering of local bike shops, coaches, light refreshments, tours of the Winter Training Facility and perhaps even a Computrainer Bike Race….. Details coming soon. This is a great kickoff to the indoor season. This year’s Kids’ Tri concluded another successful season. Coaches Caryl Kinney, Christine Brown and Renee Williams do a tremendous job of turning a training program into an event which the kids crave. In addition, the parents played in big part in the program through weekly volunteering and being on the course during the actual race. Weekly training nights provide the kids with not just a thorough training program, but with a venue where they learn responsibility and how to lead an active lifestyle. Most apparent however, is that the kids HAVE FUN! This just might be one the club’s best supported programs. 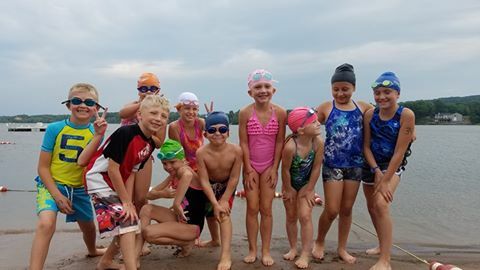 The Kids’ Tri was the finale to the program and was held Aug. 21, the morning of the Tri Club picnic. The heavy rains held off, and we had 23 racers in a few different divisions. Upon completion of the race, kids and parents joined other club members for the picnic. Paid for by the club, the annual picnic attracted more than 100 members and guests who enjoyed Dinosaur Barbecue (next year we will expand the vegetarian offerings). Sam Sampere raffled off a number of gifts from Syracuse Bicycle, Advance Cyclery and the Rabin Law Firm. This was truly a family event. Many thanks to Mary Lou Plante for organizing, running and doing just about everything needed for this event. Heading to T1 at Iron Girl. I was born in California and lived there for 10 years. After that, I moved to Northville, N.Y. and lived th ere until going to Elmira for my undergraduate education. I graduated with my Bachelor of Science degree in chemistry and biology from Elmira College in June 2012. Currently, I am a Ph.D. candidate in the Cell and Developmental Biology department at Upstate Medical University. I started in the Biomedical Sciences program in August 2012. I work in a lab researching calcium signal transduction in cells and how it may regulate insulin secretion. How long have you been involved in triathlon and what made you take it up?I have been involved in triathlon for two years. The Upstate Women’s Health Network was looking to sponsor individuals employed by Upstate to compete in the event. On a whim, I decided to try a triathlon, so I signed up and realized I’d better learn how to swim quick! Even before seeing the advertisement I had heard a little about triathlons and already had a piqued interest. Getting my first bike in the spring of that year also helped. I was biking quite often with my boss, an avid endurance cyclist, so I felt comfortable with two of the three sports. All it took was the little nudge via sponsored opportunity and I was hooked! Who is your hero? My parents. Without them I would not be where I am or the person I am or today. They have instilled values in me that help drive my triathlon success: hard work and determination. varsity team. I still play soccer on a couple indoor recreational leagues in Syracuse. I have always loved running, but did not start running in road races after high school until I moved to Syracuse for my graduate education. What are your triathlon strengths and weaknesses? My strength is definitely the run. It is the leg I enjoy most, feel comfortable with, and catch the most people on. It makes up for my slow start in the swim, which is my greatest weakness! I did not learn freestyle swimming until I taught myself (enough to move forward ) about a month before my first triathlon. Since then I have taken a few swim classes and worked more consistently on the swim, so it is getting better slowly but surely! What was your first triathlon and what do you remember most? 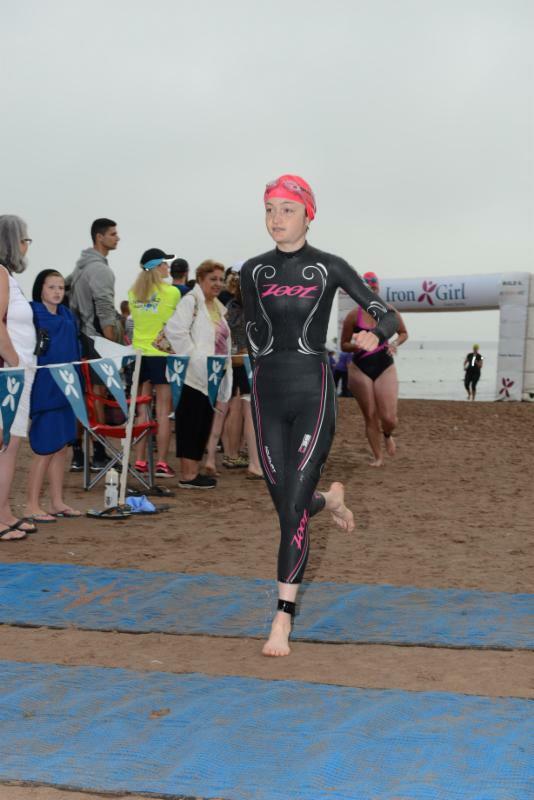 My first triathlon was Iron Girl 2014. What I remember most was being hooked on the sport immediately. I crossed the finish line and felt so happy. The support and environment during the whole race were very positive; definitely a good race for anyone considering their first tri. What is your favorite race and why? Green Lakes sprint triathlon is my favorite because I just love the location. For starters, it is close to home, so travel time is nil. It is my favorite local place to open water swim as the water is typically calm and seems to have the least weed and algae issues. I also love the climb back into the park on the bike course. Going up hills is my strength on the bike, so that challenging climb gives me the chance to catch some people. And finally, running on the trails around the lakes is beautiful and shaded. What was your worst race and why? This year’s Cazenovia Olympic tri was my worst by far. I guess I was just having an off day and did not hydrate/fuel properly because I barely made it across the finish line before collapsing due to dehydration. It was a long-lasting and awful feeling I have never even come close to experiencing before and I hope to never experience again. Lesson learned: recovery is important. I had a very busy race month in August with an event every weekend. Couple that with the unusually hot weather we have had and I think I had run myself down before the tri even started. What races are on your race calendar for 2017? I am in a difficult situation this year in considering races for next summer. I am working on trying to wrap up my thesis research. If I finish in May, I will be moving to wherever I can secure a post-doctoral position, so I am not signing up for any races until I know where I will be living. If I am still in Syracuse, I would like to try my first half, so I would probably sign up for the Syracuse 70.3. 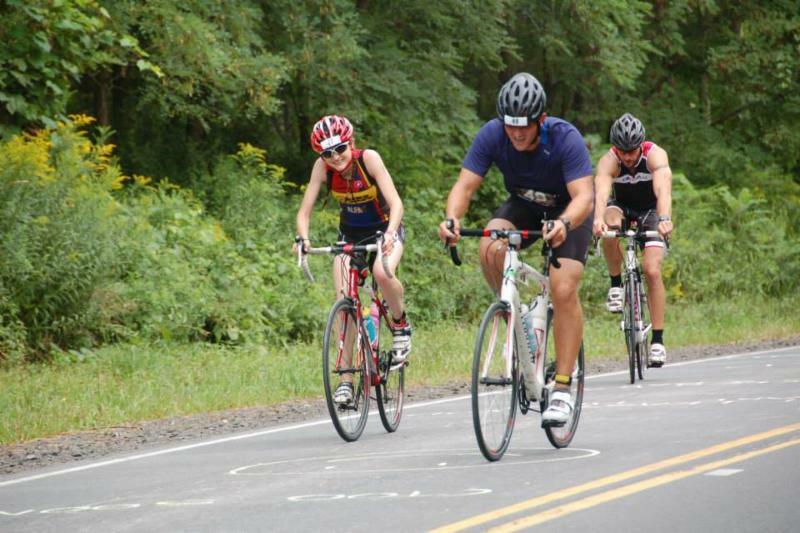 I may also do Du the Lakes Duathlon, Green Lakes sprint tri, Gillie Girl sprint and Cazenovia intermediate. I am also considering going to Nationals for either sprint or Olympic tri, as I have heard many positive experiences from it. Since I love running, I will likely also do several running races of varying distances, including the Boston Marathon in April. What are your goals for the next year? I anticipate next year to be very busy. My biggest goal is to successfully defend my thesis and earn my Ph.D. I also hope to continue training hard and seeing improvements in my swim, bike and run. In five years you hope to … : Have a job in pharmaceutical research where I can work on a project to advance medicine for the betterment of human health. I also hope to continue to participate in triathlons and find a tri club wherever I move. One of the saddest things about leaving Syracuse will be leaving behind this awesome tri club and all the friends I have made. Something most people don’t know about you: I am a vegetarian. 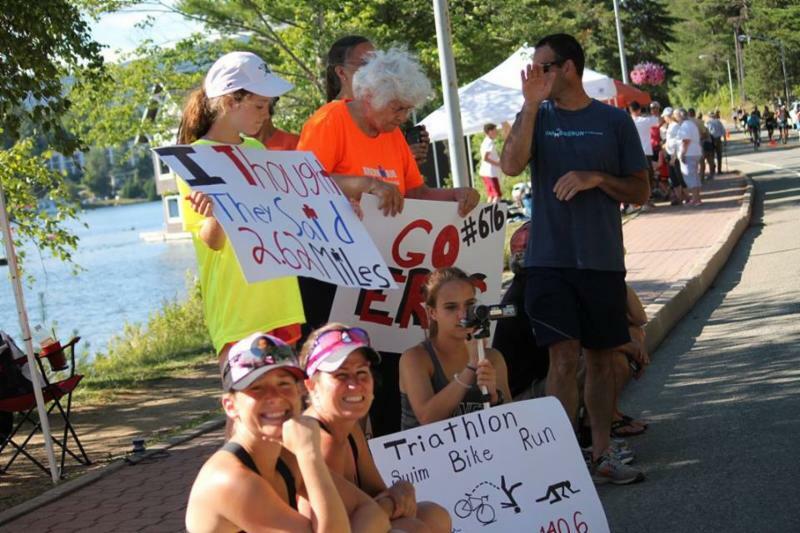 What triathlon has taught you: There is a great community of triathletes who are there for each other when needed. There is always someone to cheer you on, get you out the door to a workout, push you harder, offer tips, congratulate you on a job well done, and in general help you out in any way needed. Before joining the Central New York triathlon community, I did not know many people in Syracuse (since I moved here by myself for school). Now I feel at home. I have met so many people and made many new friends through triathlon. Editor’s note: Heather Nelson won this year’s Iron Girl Syracuse competitive division. © 2014, CNY Triathlon Club, Inc. PO Box 434 Dewitt, NY 13214; site by Variety Studios.